​​Hollywood is determined to make “video game movies” work. Dozens of video game adaptations have tried with little or no success. The “Tomb Raider” series itself has already been made into two moderately successful films starring Angelina Jolie, though they weren’t heralded for their quality. 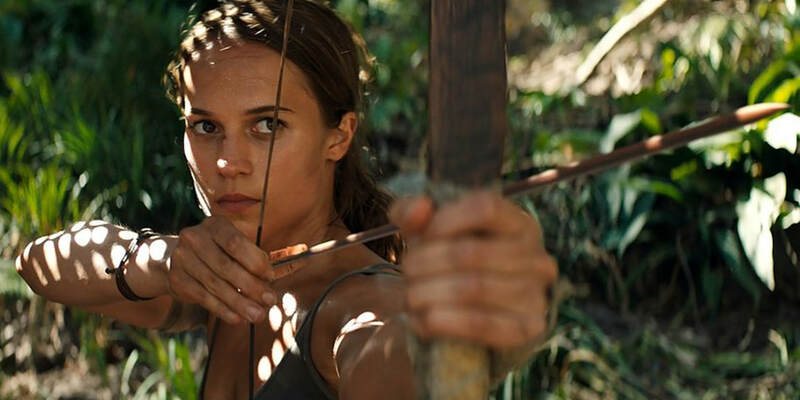 Now, Alicia Vikander stars as Lara Croft, the titular “Tomb Raider.” Though it’s far from breaking new ground and is plagued by poor writing, it’s a mostly enjoyable action film. As “Tomb Raider” begins, Lara’s father Richard (Dominic West) has been missing for seven years, presumed dead. Naturally, she refuses to believe that he’s truly gone. Lara also refuses to sign papers declaring him dead (Which would also grant her his fortune). She lives in denial, having to work as a bike messenger to pay the bills. This does give us a pretty excellent bike chase scene through the streets of London, the first of many strong action sequences. Still, she can’t live this way for long. Instead, she’s determined to find Richard. After uncovering his research, Lara sets off on a mission to find her father, no matter what it takes. Turns out he was searching for some ancient tomb (As one would expect) with an ominous history. He read tales of a frightening woman, or queen, or something. There’s plenty of clunky exposition as Lara reads through her father’s findings, though it does little for the audience. What’s in the tomb is of little consequence for almost this entire film, so the poorly scripted montages of Richard’s research only slow us down. Lara jets off to Japan and teams up with a ship captain named Lu Ren (Daniel Wu), who inexplicably speaks in a perfect American accent. They sail to the mysterious island where both their fathers seem to have gone missing. It’s one of those islands that no one knows about and is impossible to get to, but our characters make it work. They get there, though the ship runs aground in the middle of an intense storm. This sequence is a big CGI mess, but it’s still really thrilling. This becomes a recurring theme throughout the film. Vikander is the star of the show, and she knocks it out of the park. She’s totally committed to every stunt and really makes for a captivating action hero. Though she’s given some pretty cliche dialogue and simple motivations, Vikander never phones it in. Neither does Walton Goggins as our mysterious villain Vogel. He’s creepy and steady, just as he should be. If you’ve played any of the “Tomb Raider” video games, you’ll recognize plenty of familiar sequences. There are puzzles to unlock, jumping, falling and dangling animations ripped straight from the video game, sneaking through a heavily guarded camp, Lara’s classic bow-and-arrow along with other weaponry moments. Thankfully, none of these nods to the games feel forced or out of place. The film doesn’t stop to tip its hat to the source material. And don’t worry: a tomb is raided by the time the credits roll despite how much more grounded the story feels compared to the Jolie originals. Aside from Vikander’s performance, the film is really held up by mostly thrilling action sequences. There’s a scene involving a rusted airplane and a waterfall that’s truly tense. These individual scenes work really well to help keep the audience engaged, even if the visual effects look pretty cheap. Nothing about the action is really innovative, but it accomplishes its task in being enjoyable enough. "Tomb Raider" is a fun film overall with good action, though it will likely be easily forgotten. The story never grabbed me in any way, so every beat was expected. We never care enough about the contents of the tomb to invest the time in remembering the clues. There is some decent enough emotion between Lara and her father Richard and the connection they share but it never matters anyway, since the action is the real meat here. All in all, “Tomb Raider” could’ve been far worse. For as atrocious as video game adaptations have been throughout Hollywood's history, I think we can settle for one that’s just fine and nothing more.